Very Tangy and unlike the name - not bitter at all! Do try it and am sure you are going to like this. This is a great way to serve bitter gourd to children. Heat oil in a pan, add mustard seeds and asafoetida. When seeds crackle, add dried red chili and curry leaves . In a small bowl mix together tamarind paste , jaggery , red chili powder , rasam powder, turmeric powder and little water. Mix well. Add this mixture to the pan. Add finely chopped bitter gourd pieces, coriander leaves , salt and cook with lid covered till they are soft. Add 1 cup of water and cook with lid covered for 5-6 minutes. 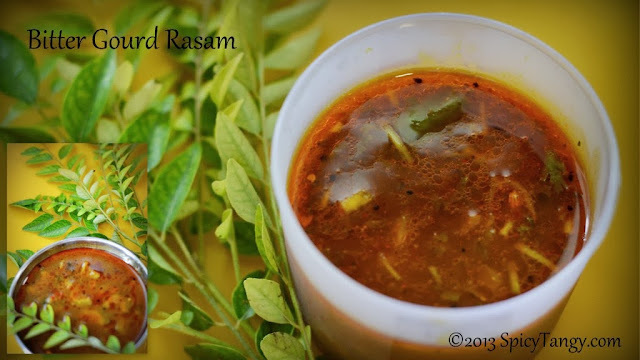 Serve hot with rice, papad and pickle. After chopping the bitter gourd , sprinkle some salt and keep them aside. Salt will take the bitterness away. you can squeeze the salt water and use the bitter gourd. You can add some coconut milk at the end and cook for 2 to 3 minutes.